Yamaha is a well-known name in the automobile market and it began with simple and inexpensive machines but has grown to its position as a power sports powerhouse, offering some of the best sports bikes, cruisers and off-road bikes on the market. Yamaha Ray - Z is one of the first scooters that the company had introduced for the Indian two- wheeler market. Yamaha Ray- Z is designed to feature an edgy styling to attract youngsters who crave a reliable city commuting scooter. 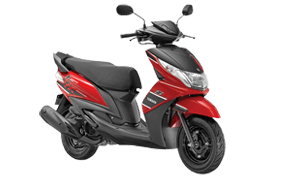 The Ray-Z has been designed to look sporty and presents itself as an easy to ride a two-wheeler. The scooter has decent handling characteristics that are enjoyed by the riders and it feels really nimble in tight city traffic. The straight line stability of the scooter is also satisfactory and the customer hardly feels that the Ray loses its composure when pushed hard. The Ray-Z features a smoked-finish visor, a new instrument panel, a carbon fiber patterned seat and aluminum rear grab-bars. The visor of the scooter, along with the headlamp positioning at the apron make the front end looks really appealing. The front section of this scooter looks sleek and the headlamp is fitted at the apron instead of the conventional front cowl. The front features also include V-shaped headlights while the rear houses a stylish tail lamp assembly with clear-lens indicators. The seat of the scooter also looks well spacious and well padded along with the stylish streak at the same time. The Yamaha Ray Z comes drenched in an all black theme. The rear end receives a body colored wing type grab rail that further steps up the visuals. The Ray is available in a total of four color options to choose from namely Regal Red, Astral Blue, Moon Walk White and True Blue. The scooter gets a stylish instrument cluster which makes the ride smooth and that has been designed in sync with carbon fiber appearance and hence, looks impressive. Despite the lean and sculpted body, the under seat storage, with a 15.5- litre capacity, is spacious enough for a full face helmet and the floorboard has enough place for your legs. The Ray-Z continues to be powered by the standard 113cc engine which produces7bhp and 8Nm of torque via a CVT gearbox. The Blue Core enabled motor of the scooter generates respective power and torque of 7bhp and 8Nm. The Yamaha Ray Z gets 130mm drum brakes at both ends that offer an effective braking. The suspension assembly of this scooter has telescopic forks at the front while the rear end is taken care of by spring aided hydraulic shock absorber. The engine is enabled with the company’s patented Blue Core technology that ensures good combustion efficiency along with a decent fuel economy. The Ray –Z scooter has a total curb weight of just 104kg, and hence it results in making it an easy to ride and lightweight for the two-wheeler rider. The Ray -Z scooter has a maintenance-free battery that actually proves less hefty on the pocket of the rider of the vehicle which makes it a preferable ride. Yamaha Ray-Z bike insurance not only ensures your bike but it can also cover the extras and accessories that make it personal. One will be served with the best at the garage during the insurance security. At the garage, the quality of the work is not compromised at all. In case of any repair or change in the motorcycle parts, only the genuine Yamaha Ray- Z motorcycle parts are used. The whole repair process is assisted by the professionals of Yamaha Ray-Z motorcycle. As it is mandatory by the Indian law that the vehicle owner should have third party insurance so one need to buy the insurance that not only covers the third party but also the vehicle and the individual. Personal accident cover of up to Rs. 1 lakh is available for injuries to the driver/owner under bike insurance. The benefit of cashless transactions through network garages. Roadside assistance in case of bike breakdown.